It has been a while since the Alliance and Horde had a proper punch-up, hasn’t it? Since Mists of Pandaria, the two factions have been too occupied with taking down the Legion to think about battering each other. 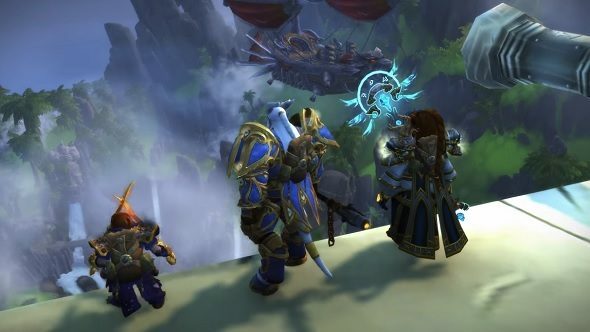 PvP has hardly stopped in the last five years, but both Warlords of Draenor and Legion flew by without a new Battleground, leaving us to scrap on the ageing battlefields of wars past. But Battle for Azeroth is set to bring back faction wars to World of Warcraft in full, with a brand new Battleground in tow. Want more info on the expansion? Here’s everything we know about WoW: Battle for Azeroth. Seething Shore might not arrive in earnest until September’s expansion hits, but players are already spilling blood on the sand thanks to this week’s Brawl. Like other Blizzard titles, World of Warcraft cycles through unique PvP modes in the form of Brawls – anything from resurrecting 40v40 Tarren Mill skirmishes, to engulfing Arathi Basin in a snowstorm that would make last week’s Beast from the East blush. 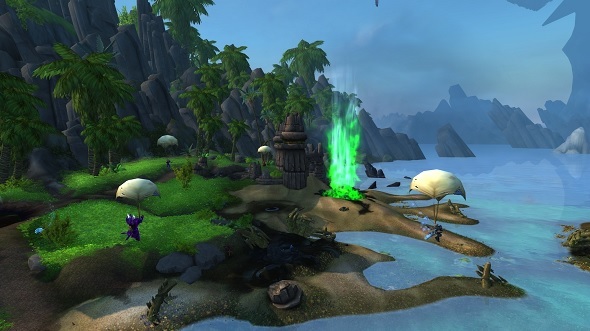 Taking place on an enclosed beach off the shore of Feralas, Seething Shore pits two teams of ten against each other in a race to mine Azerite – the hot new resource everyone is after these days. Arriving on airships, players parachute onto the battlefield in a way that is more than a little bit reminiscent of PUBG. Nodes erupt from the map periodically for players to mine – new ones bursting through the sand as the old are destroyed. Naturally, the team that mines the most rocks first is the one that wins. Seething Shore openly rejects the bigger-is-better philosophy that seems to have driven so many Battlegrounds in the past. It often felt like these PvP spaces were meant to drive the feeling of being part of a vast army, clashing with dozens of foes over wide, open landscapes. But since the days of week-long Alterac Valley battles, arenas have got smaller, distanced from this open warfare fantasy. More ambitious attempts – like the shoreline siege of Strand of the Ancients – attempted to bring back some cinematic flair, but were often more fun to describe than to actually play. Spectacle returns, with Seething Shore, but in a much more palatable way. The choice of having teams plummet through the skies on respawn is more than a cool way to start engagements – it is a quick way to get back to the fight as soon as possible, and cuts out any possibilities for spawn camping. Past Battlegrounds have only ever had a small tracker atop the screen to keep note of how a round is going; but here, a voice-acted NPC barks from the airship above, keeping you updated. Objective capture is still the name of the game, but each node is its own arena, with its own terrain challenges – and none are more than a moment’s walk from the next. All this makes Seething Shore feel more modern than its counterparts. After five years, Battlegrounds are back, and up to speed with the design sensibilities of 2018, not 2004. Drop players into the action, fast, and keep them there. Rounds are short, but exciting – and while I have always had a soft spot for the grand open warfare of Battlegrounds past, the sheer time and travel involved can often get old. But in place of recreating a fantasy, this small, bloodsoaked beach sets out to create one of the most solid PvP experiences in World of Warcraft to date.